The world seemed to conspire against Sue Schillings desire to paint until one day in 2002 when she took a photograph of Polly’s on the Pier. 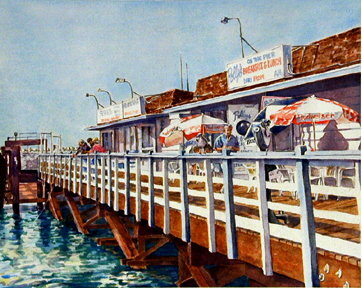 In 2002, Sue Schilling snapped a photograph of Polly’s on the Pier for an art class she was taking at El Camino College. A few weeks later she brought a half finished water color painting of the photograph to the Redondo Sport Fishing Pier restaurant to show members of the women’s group she meets with each Tuesday. One of waitresses noticed that the painting contained a likeness of owner Terry Turk and asked to show it to him. Turk was so impressed he asked if he could buy the painting when it was completed. Then the waitress asked to purchase the watercolor, as did nearly every customer in the restaurant, including all the women in her women’s group. The popularity of her Polly’s painting spawned a successful water coloring career that is still flourishing. But as breezy as that first sale was, the events leading to that point in her life were anything but. The affable Schilling was born in Kokomo, Indiana, and moved to California at 17 because her mother wanted to live in a warmer climate. They settled in West Torrance, where Schilling has lived ever since. Her high school art teacher inspired her to become an art instructor and she earned a bachelor of arts at Cal State Long Beach as well as an art teaching credential. But at 24, before she could embark too far down this path she fell in love with her future husband Bob. Children soon followed and Schilling discovered that art and diaper changing did not mix. The demands increased manifold in 1982 when her second child, a son, had a severe reaction to the childhood immunization DPT at age six months. He became legally blind as well as developmentally disabled. In characteristic fashion, Schilling not only handled the increased workload a special needs child requires, but began taking on the school system as well when she felt her child’s educational requirements were not being met. She took a part time job working at the schools her child attended and launched a support group for parents of other special needs children. As a result of her efforts, her son was not only able to continue to attend regular elementary and high schools, he became a cross country and track runner as well. During her work at the schools, Schilling was inspired by the zest for life some of the women she worked with exhibited. She decided that when the demands put on her by parenting a special needs child had diminished sufficiently, she would pick up where she left off with her artwork. Rather than wallow in sell -pity, she enrolled in El Camino College’s art program and began an aggressive campaign to hone her watercolor skills. At about the same time, she began an informal women’s group that still meets every Thesday at 10 a.m. at Polly’s on the Pier. Thankfully, the drug Embrel hit the market during this time. At 10 years and counting she is still able to control the potentially crippling disease. After the enthusiastic response to her water coloring of Polly’s she tallied up the requests. They totaled 42. Not wanting to sell the original, nor paint 42 copies, she investigated a process known as Giclee printing, which uses archival ink on 100 percent cotton paper. Only an expert can tell the difference between an original water coloring and a Giclee, but a Giclee will last two centuries without fading. Since that day in 2002, she has sold over 300 Giclees of her Polly’s watercoloring. She approached her customers and asked if they would be willing to buy copies of her water-color as long as they were numbered and signed. Her children are now grown. Her daughter Jessica is 32 and son Andrew is 25. Schilling has used her newfound time to render many other South Bay scenes. Among the most popular are the Point Vicente lighthouse, dories on the beach in Hermosa, and the Manhattan Beach Pier roundhouse. She also enjoys doing watercolors of flowers, and has a backlog of scenes she wants to paint from a recent trip to Italy with her husband. On most Sundays, from 10 a.m. to 2 p.m. Schilling can be found displaying her work near the scene of her first success, at the foot of Redondo sport-fishing pier. Joanne Turk, the wife of Polly’s owner Terry, and president of the King Harbor Association, commented, ‘Sue brings lots of activity to the area which is a’win-win’ for Polly’s and the harbor area as well as the city. We want to bring the arts back to the area. Schilling credits her husband for providing the support system that allows her to pursue her passion. And she credits an uncle whom, she said, ”Taught me that success and happiness just don’t happen, but that they are something you have to work at continually.’ Schilling’s web site is www h2ocoIorsbysuecom. 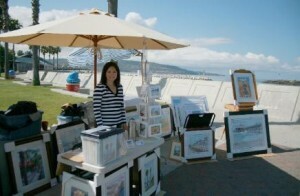 Schilling has been a fixture at the Redondo Beach Pier where she sells her paintings.